All Computer Tips, Tricks And Tutorials. Access to your programs easily using Handy Start Menu. Handy Start Menu categorizes all the software's installed on your computer to the related category name. 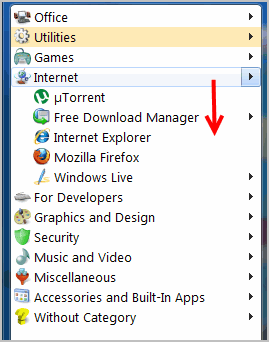 For example if you have installed the software like Mozilla Firefox, Chrome, Yahoo Messenger, Utorrent, Team Viewer.. etc it will show all these programs in Internet Category. So we no need to go the software's group and open application in the start menu. Just we can open by viewing the category items and select the application. Remove the shortcuts form the desktop and enjoy the wallpaper without any distractions. Also Read: How to set shortcut to open any application in start menu. 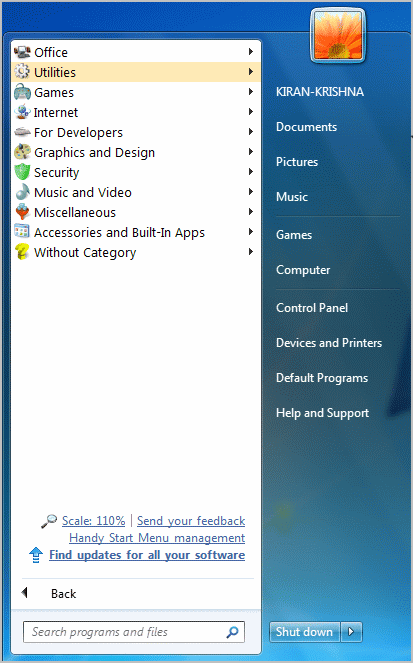 By installing this Handy Start Menu on Windows 8 Operating system it will bring back the start menu. Windows XP, Windows Vista, Windows 7 & Windows 8. If You Like This Post. Please Take 5 Seconds To Share It. Greet your friends with a colorful text on facebook chat. Just type below and copy generated code to facebook chat. Invite and Add all your Facebook friends to group using this simple bookmark. Make your Facebook timeline as a movie with Timeline Movie Maker. This is very interesting, surely your will like it.